While Razer’s first offering into the laptop market – the Razer Blade – had a lot of promise (and power), its 14-inch display can be limiting for some persons. The Razer Blade Pro has more screen estate with its larger 17-inch screen. The screen isn’t only the updated part of this laptop; the pricier 4K variant of the Razer Blade Pro sports a 4K display, 32GB of RAM (which is double the Razer Blade’s). More to these is the advanced Nvidia GeForce GTX 1080 GPU (with 8GB of VRAM), a faster Core i7 processor and more storage space. The Razer Blade Pro looks very much like its younger sibling – the 14-inch Razer Blade. Measuring 0.89 inches thick and 6.1 pounds heavy, the Razer Blade Pro is undoubtedly the lightest and thinnest gaming laptop with a 17-inch screen. Other dimensions are 16.7 x 11 inches (width x depth). Razer made some major changes to the Blade laptop, for one, the touchpad has been repositioned and sits adjacent to the keyboard. 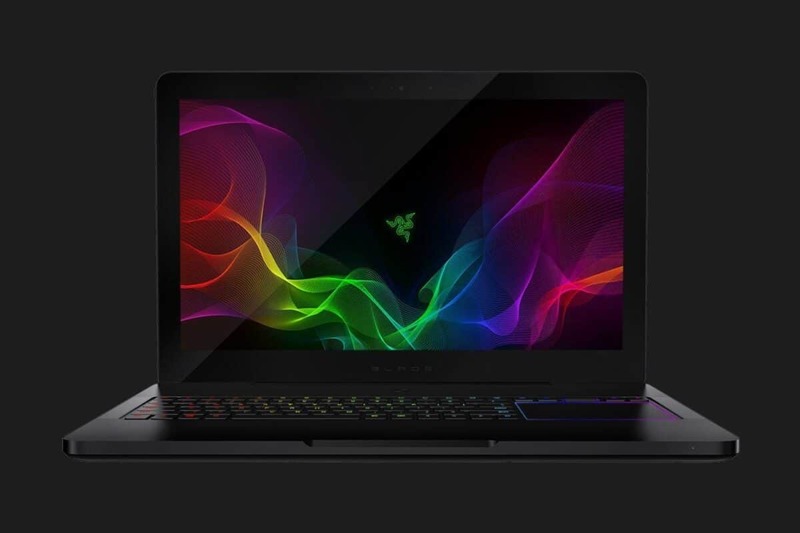 The Razer Blade Pro comes in two screen models: the cheaper matte one with Full HD resolution (with 120Hz refresh rate) and a costlier glossy Ultra HD/4K variant (with 60Hz refresh rate and G-Sync support). Whichever the model, they both measure 17.3-inches in diagonal length. And so you know, the higher the resolution, the faster the battery drain. Razer made a shift in the design of the keyboard and touchpad. Unlike what we saw with the original Razer Blade, the touchpad now sits adjacently to the right of the keyboard. The touchpad has a green outline bordering it. Atop this touchpad is a scroll wheel and some quick control media keys. The keyboard comes with RGB backlighting just like with the Razer Blade meaning you can customize the backlighting for each key. The really flat keys on the keyboard have a 1.7mm key travel and make typing comfortable. As we’ve seen with other slim but powerful laptops the Razer Blade Pro packs some powerful hardware in a slender chassis. A high-end Nvidia GeForce GTX 1080 GPU (with 8GB of VRAM) is present on the costlier 4K model while the 1080p version uses a GTX 1060 GPU (with 6GB of VRAM). At the heart of the Razer Blade Pro is the Intel Core i7-7820HK processor clocked at 2.9GHz paired with a whopping 32GB of RAM. For storage, the 4K model uses at least 512GB of SSD while the 1080p variant packs a 256GB SSD + 2TB HDD combo. The above hardware combination ensures that you never miss any frame while gaming on the Razer Blade Pro laptop. Battery life on the Razer Blade Pro is dependent on the model. While the cheaper 1080p one has a 70Whr battery, the 4K version is equipped with a larger 99Wh battery that should last longer – at least on paper. Ports are limited on the Razer Blade Pro. There are three USB 3.0 ports in addition to one Thunderbolt 3 port. HDMI 2.0 port, Ethernet port, and a card reader are also available. A single 3.5mm audio jack is present on the Razer Blade Pro as well. The Razer Blade Pro laptop with Full HD display goes for $2800 for a start, while the 4K one would set you back between $4700 to $6000. The Razer Blade Pro is another device that sets the fact straight concerning ultra-thin gaming laptops. in all of its slenderness, the Razer Blade Pro does not compromise in terms of performance as we have just seen.